LANGLEY — Day 1 at the B.C. 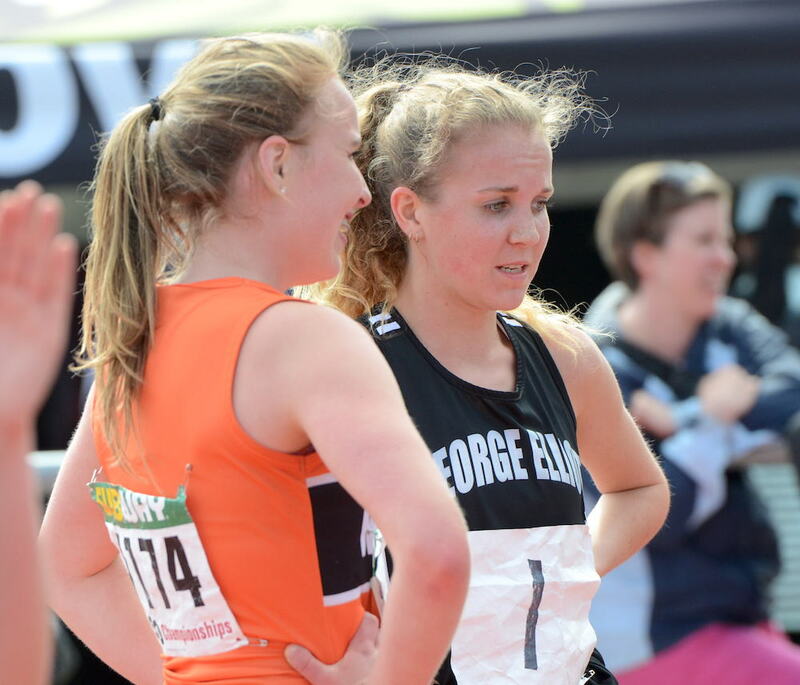 high school track and field championships is always the quietest of the annual three-day extravaganza. Yet as usual, it sets up the storylines that are to follow as the 2017-18 sports years continues to wind down to the end of its calendar season. 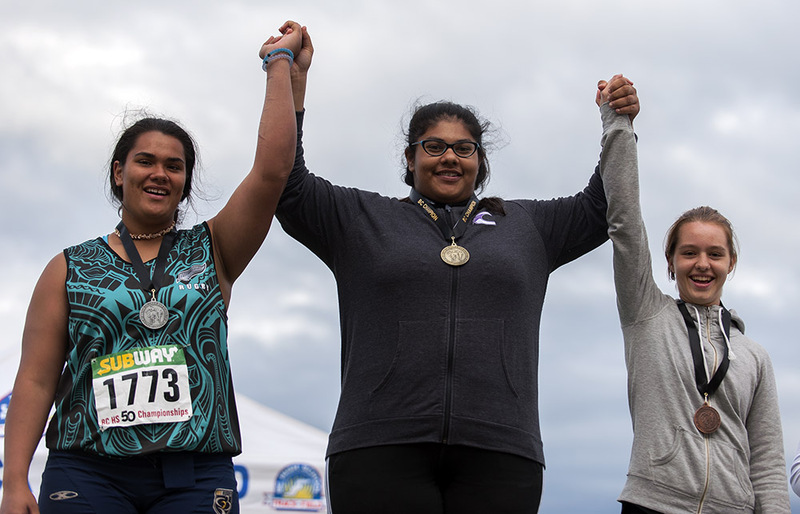 1 Dolly Gabri of Surrey’s Sullivan Heights Secondary has been making news ever since she picked up the discus and shot and came to these championships as an eighth grader back in 2015, immediately setting JV meet standards in both disciplines. On Thursday, the now-Grade 11 Gabri repeated as senior girls discus winner at 43.89 metres. Last year, she won the senior competition as a 10th grader with a throw of 44.02 metres. 2 Riley Miller of Surrey’s Holy Cross Crusaders sizzled in the 1500m boys heats, turning in the top time of 4:09.07, five seconds ahead of the rest of the pack. 3 Jasmine Lew of Port Moody’s Heritage Woods Kodiaks took gold in the girls long jump with a very healthy leap of 5.74 metres. 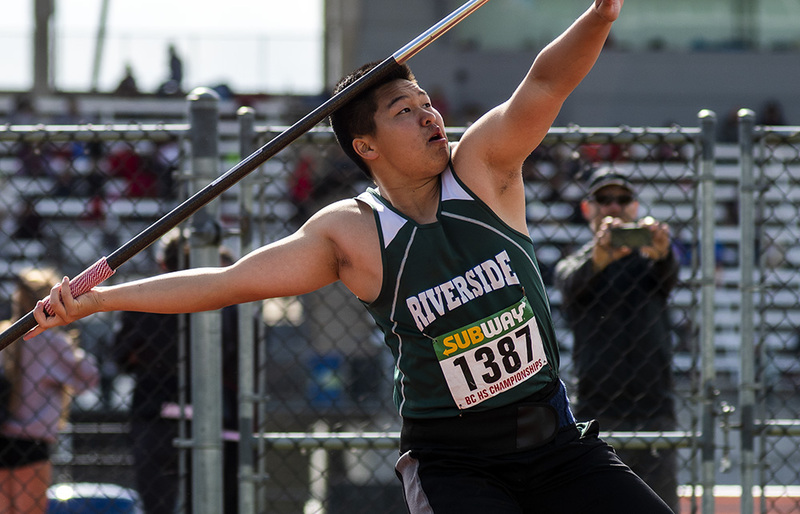 4 Jarrett Chong of PoCo’s Riverside Rapids, won the boys javelin at 55.47 metres, more than three metres ahead of Brentwood College’s silver medallist Sion Griffiths (52.22 metres). 5 Last season, Lake Country-George Elliott’s Taryn O’Neill and Grace Fetherstonhaugh of New Westminster, were Nos. 2-3 in the girls 1,500m. In the heats on Thursday, with last year’s winner Desirae Ridenour of Cowichan moved on to a triathlon career, Fetherstonhaugh, the Oregon State signee, turned in the fastest time at 4:52.13. Brentwood College’s Madison Heisterman was second at 4:52.39 and Carson Graham’s Sophie Konrad third at 4:52.68. O’Neill clocked a 4:53.75 to earn her spot among the qualifiers in one the most prestigious races in the provincial high school canon. 6 Right in his own back yard, Langley Secondary’s Kevin Hughes turned in the fastest time in heats for the boys 400m, clocking in at 49.84 seconds. Last season’s silver medalist, Egidio Cantarella of Vancouver College, was third at 50.39. 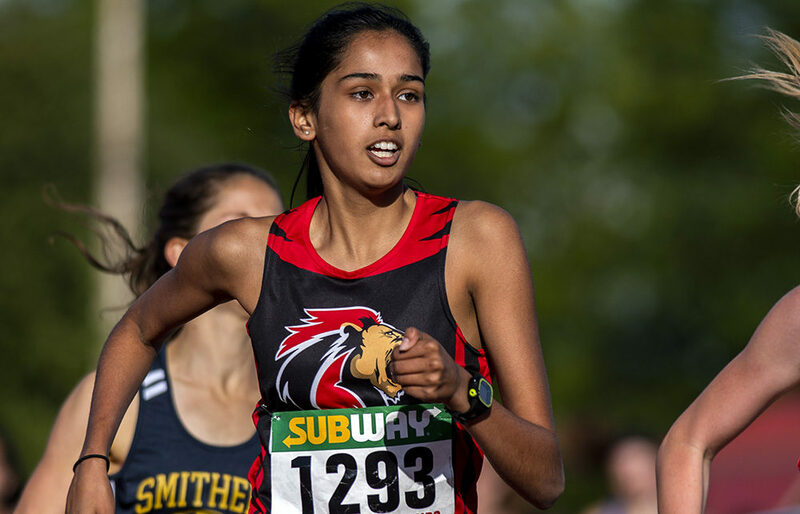 7 Jasneet Nijjar, of Surrey’s Queen Elizabeth Royals, a winner last season 55.36, turned in the fastest time of the girls 400m heats at 57.42. 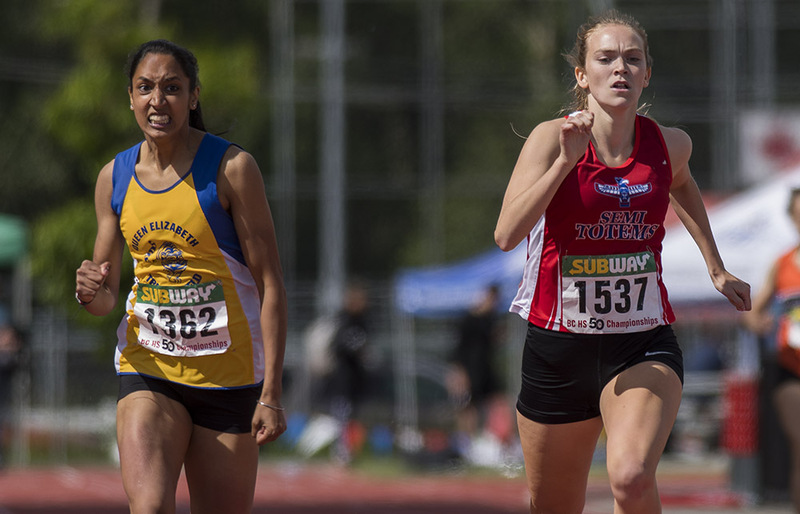 8 After not qualifying for the finals of the girls 4x100m relay last season, the Oak Bay Breakers ladies clocked fastest in the heats on Thursday at 50.64 seconds. 9 Last season’s Vancouver College boys squad set a new meet record in the heats for the 4x100m at 42.14 seconds. The St. Thomas More Knights weren’t quite as swift, but they are sitting pretty in the latest heats, topping the pack Thursday at 43.86 seconds. 10 Hey, we’re one short! OK, how about casting an eye to today’s 100m boys finals, with the question: When will the record of St. Thomas More’s Peter Ogilvie, set in 1990 (and I was there at the race at Swangard), finally fall? For the record, Ogilvie ran a 10.46 seconds that day and his reign as B.C.’s fastest schoolboy is looking to celebrate its 28th birthday unless someone really turns on the jets today at around 3:15 p.m. this afternoon.